The downtown Dallas public library strives to be a place that doesn't just tolerate the homeless, but welcomes them. A big city library has turned around the way it handles some of its most marginalized visitors. The Dallas Public Library has committed to not just tolerating—but welcoming—every homeless person who walks through the door. Dallas in the winter isn’t exactly Siberia, but some January days are bitter. Just ask 55-year-old David Jackson. “It’s cold, it’s dark and you got to lay your head down a spot you feel safe, you can’t just lay down anywhere," he says. Jackson usually sleeps under a bridge. He hasn’t had a place to live in a very long time. His issues include both addiction and mental illness, and the downtown Dallas library is a haven on a raw January day. “The library’s a good place for the homeless. It’s warm, you’ve got different floors to go to, you got your own space," Jackson says. David Jackson has been homeless on and off for 20 years. And that sums up why so many homeless men and women gather at the library. It’s clean, it’s quiet, and there’s plenty to do. And in Dallas, the library strives to be welcoming. She says this attitude adjustment is working. There have been fewer outbursts from homeless patrons inside the library, and not one official complaint lodged against a homeless person in more than a year. The downtown library has taken down all the "no" signs: No eating, no drinking, no sleeping have been replaced with signs that say things like "respect others." On days when the temperatures dip below freezing, staffers open up a little early. “Around 7:30, 8 in the morning, depending on when we get it together, we do open the doors on the first floor and allow folks, everyone in, and we take an extra step and we actually serve hot coffee," Giudice says. The library’s Heather Lowe runs that early morning coffee show. “We have space and it doesn’t take much effort other than maybe setting your alarm a little bit earlier to come in and just be with people and bring them out of the cold and have some conversation," she says. She loves how the ritual has helped the folks who work at the library figure out just how diverse of the homeless population is. “They are concert pianists or they graduated with an engineering degree," Lowe says. 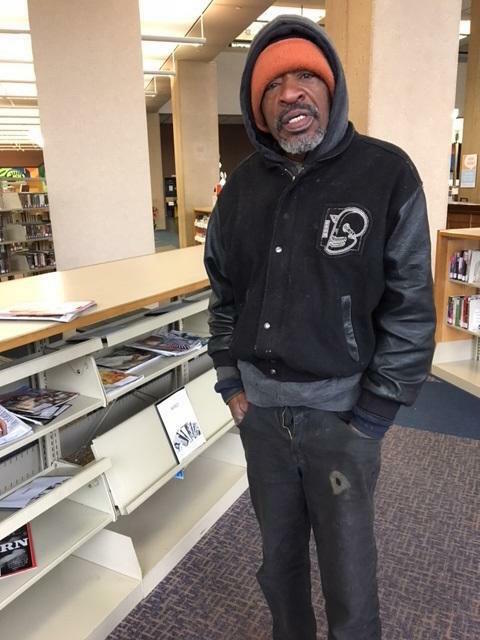 "It’s really impressed upon me and staff here across the library that the only thing standing between any of us and homelessness is a social safety net and a bad circumstance, some sort of catastrophe." As Guidice points out, it’s a grueling nighttime exercise where people count the homeless where they live -- on the street. Cindy Crain runs the Metro Dallas Homeless Alliance. She’s also a member of the KERA Community Advisory Board. She says the count doesn’t work without a lot of people counting. “Because we’re talking about such an extraordinarily large geographic area -- both Dallas and Collin County -- in order for that count to be accurate, you literally have to have hundreds of volunteers, to do a blitz count, all to go out on one night," Crain says. The library is a reliable source of volunteers. Forty staffers signed up last year, and the library expects even more to turn out for this year's count on Jan. 26. Guidice says that one cold night of harsh reality is a worthwhile window into a very different world. An opportunity to change the lives of those being counted, and to change the view of those doing the counting. What does the health care marketplace have in common with the Dewey Decimal Classification System? First, they both can seem extremely confusing. Second, the library is the place to go for answers.